Kyrie Irving scores 37 points to propel a fourth quarter comeback as the Boston Celtics beat the Indiana Pacers 99-91. Nikola Vucevic scores 25 as the Magic get the win and wrap up a playoff berth. Kyrie Irving scores 30 points as the Celtics get over the Pacers 114-112. Celtics Reporter/Analyst Marc D’Amico and Gordon Hayward breakdown his game play in the film room. Native of Brownsburg, Ind. 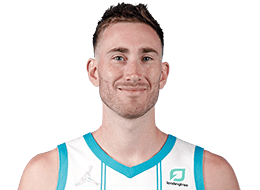 ... Full name is Gordon Daniel Hayward ... Married to Robyn ... Has one daughter, Bernie, born summer of 2015 ... Son of Gordon and Jody Hayward ... Both his parents stand 5-foot-10 ... Twin sister, Heather, was a member of the Butler women’s tennis team ... Recorded a public service announcement with his wife for the Utah Diaper Bank in conjunction with Diaper Need Awareness Week (Sept. 28 – Oct. 4) ... Hosted a special Christmas party for local families in need in December of 2014 ... Was also a high school tennis player who advanced to the Indiana state singles quarterfinals ... Tallest player ever drafted from Butler ... First Butler player drafted since 1983 NBA Draft (Lynn Mitchem in ninth round, 186th overall) ... His advice to kids is “Dream Big!” ... Was majoring in computer engineering at Butler and maintained a 3.31 GPA (selected Third Team Academic All-American) and has continued his education through online coursework ... Partnered with IGN Entertainment to participate in the IGN Pro League, a live 256-player StarCraft 2 tournament at Caesars Atlantic City in October 2011 ... Follow him on twitter at @gordonhayward.